PCgamer has been playing a lot of Grand Theft Auto 5 for the PC and has recently broke the news as to what we can expect for the graphical options. 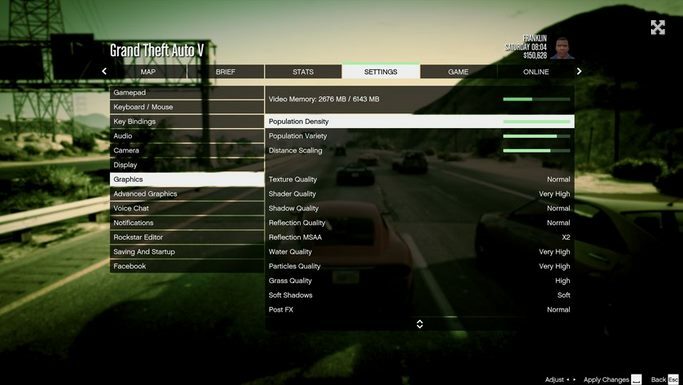 While they have been playing at a 4K resolution which will tax most PC’s out and does require a “Mega-Rig”, they have also started that if you’re gaming at 1080p or at 1440p then GTA5 won’t kick the crap out of your PC thanks to the staggering amount of graphical options that can be tuned and tweaked. Video memory slider: shows you how much video memory is being used in MB. Ignore suggested limits option: game detects your setup automatically, but you can push your system further if you like. Grand Theft Auto 5 releases on April 14 for PC and is currently available for pre-loading via steam if you’ve already pre-purchased the title.